High water can wreak havoc on your ability to catch muskies as some spots may become unrecognizeable. Plus muskies can make subtle locational adjustments. Jim Saric, Musky Hunter Managing Editor Steve Heiting, and University of Esox Instructor Kevin Schmidt reveal strategies for coping with high water. Many musky anglers pursue muskies primarily in shallow water situations. However, in some river systems as well as lakes, there is a population of muskies relating to deep water. Jim Saric and Pro Guide Spencer Berman demonstrate how to vertical jig in deep water on a river during summer. Eagle Lake in Northwest Ontario is a legendary musky fishing destination; however, muskies in the clear waters of Eagle Lake are not always easy to catch. NorthShore Lodge is located in the heart of Eagle Lake’s best musky fishing. Jim Saric, NorthShore Lodge owner Scott Jaeger and Musky Hunter Shane Spencer tackle Eagle Lake muskies in late summer. When the lakes of the north county are frozen and/or the fishing season is closed, why sit home during spring? 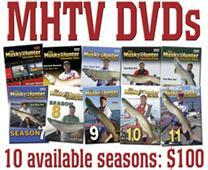 There are many musky waters in the lower Midwest teaming with muskies awaiting your presentation. Jim Saric and Pro Guide Duane Serck fish shallow cover for an early season musky bonanza. Early summer can be feast or famine since every summer can be different depending upon the weather across the musky range. The key is to stick to your high-percentage spots before trying alternatives. Jim Saric and Trophy Hunter Tom Sullivan reveal their secrets for early summer success. Restoule Lake is located approximately 4 hours north of Toronto in Ontario Canada and is a secluded gem of a musky water. If you are looking for a quiet get-away with both numbers of muskies and trophies, Restoule Lake is worth checking out. 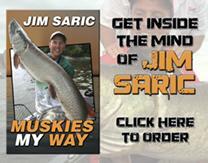 In this episode, Jim Saric and Musky Hunter John Cowan unleash the muskies of Restoule Lake. We fish the entire season hoping for a day when the muskies are on the prowl and biting everywhere. When that day comes, you have to be prepared to fish fast and be on your toes in case you hook a giant. Jim Saric and Trophy Hunter Tom Sullivan discuss strategic maneuvers you can make on the water while the muskies are on the prowl. Lake of the Woods in Northwest Ontario Canada is the dream destination for many anglers, and there is no one with more knowledge of LOW than Legendary Guide Bill Sandy. Jim Saric and Pro Guide Bill Sandy explore multiple musky patterns on LOW that yield success in summer and fall. The Musky’s range has expanded into the southern U.S., opening tremendous spring opportunities of which few musky anglers take advantage. In the first part of this two-part episode, Jim Saric and the Pro Guide team from Rock On Charters float the James River in Virginia in pursuit of southern muskies. Then, Jim Saric picks apart a southern Illinois reservoir in spring. Wiley Point is a four-star resort located approximately 20 miles southwest of Kenora, Ontario on Lake of the Woods. This area has hundreds of islands with current moving between them and the majority of them hold muskies. Even though it seems like muskies are located everywhere. it doesn’t mean they are easy to catch. Jim Saric and Pro Guide Keith Davison dissect the Wiley Point region of LOW and reveal how to catch the muskies that swim in it.